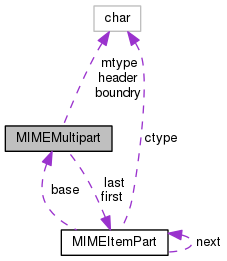 A container class for multi-part MIME document objects which can be streamed to a std::ostream destination. David Sugar dyfet.nosp@m.@ost.nosp@m.el.co.nosp@m.m container for streamable multi-part MIME documents. Definition at line 69 of file mime.h. Contruct a multi-part document, and describe it's type. Stream the "body" of the multi-part document. This involves streaming the headers and body of each document part. output to stream document body into. Get a string array of the headers to use. This is used to assist URLStream::post. Definition at line 110 of file mime.h. Stream the headers of the multi-part document. The headers of individual entities are streamed as part of the body. output to stream document header into. Definition at line 72 of file mime.h. Definition at line 73 of file mime.h. Definition at line 76 of file mime.h. Definition at line 75 of file mime.h. Definition at line 74 of file mime.h.